Agua Caliente, Guatemala – Daysi Pena had a large smile on her face after she crossed the border into Guatemala on Monday with three of her grandchildren. “I made the decision to join because there is no other alternative. I was overwhelmed by fear,” Pena told Al Jazeera after entering Guatemala not far from Agua Caliente border crossing. Pena has been raising her grandchildren in Chamelecon, a city with one of the highest murder rates in Honduras, which is among the world’s top 10 countries in terms of per capita homicide rates. Now 12, 14 and 16 years old, the grandchildren she brought with her were abandoned by their mother. Their father has been living undocumented in the US for the past five years and sends money for food when he can. The family was living in fear of criminal gang activity in their neighbourhood. 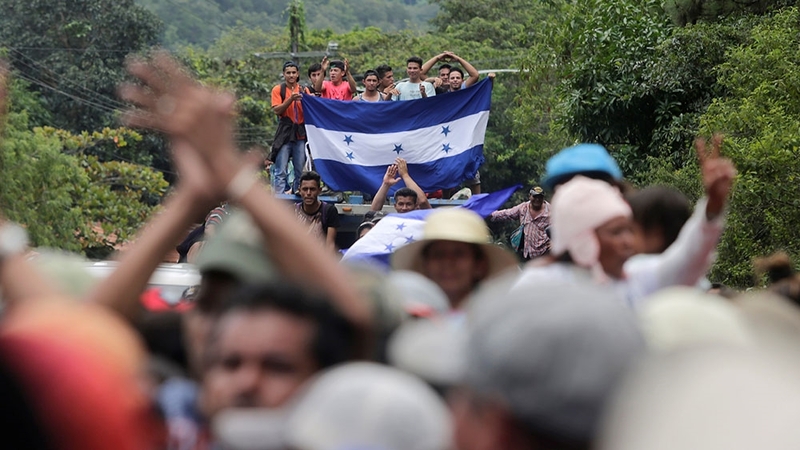 Gang members tried to recruit the two boys but it was the threat to Pena’s 14-year-old granddaughter from gang members that prompted her to leave Honduras and travel north. Pena had planned to leave in December and try to make it to the US. Aside from the children’ father, she also has a daughter who has been living legally in the US for 25 years. 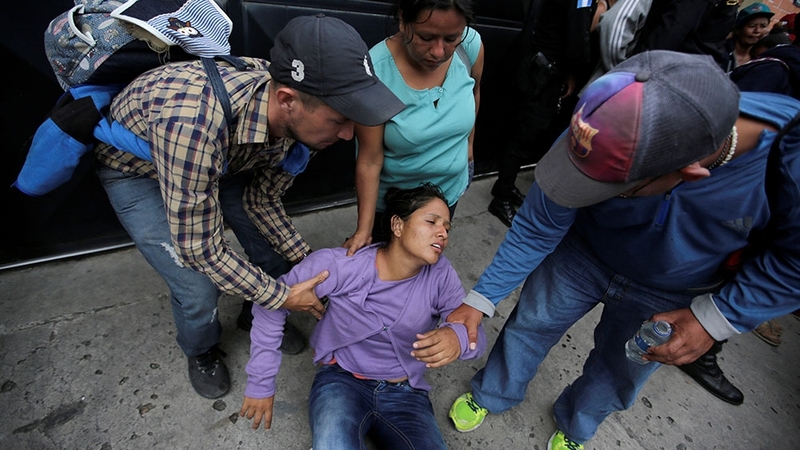 On Saturday, as she watched the news about the caravan leaving San Pedro Sula, she decided to leave then and there. Pena and her grandchildren, as well as one of her nephews, took a bus on Sunday to meet up with the group in Ocotepeque, 21 kilometres from the Guatemalan border. “We felt more strength. We felt safer,” Pena said of the decision to join the migrant caravan instead of waiting to leave on their own later this year. Among them is William Alvarado, who made the trek seven years ago. Sixteen years old at the time, he set out by himself, eventually making his way across the US-Mexico border without documents. He spent years in the US foster system before obtaining a green card. While on a visit home earlier this year, his wallet, along with his green card, was stolen. Alvarado joined the caravan after US embassy staff told him he should turn himself in at the border as a US immigration court would be able to resolve his case more quickly than they could. Babies cried in the heat and high humidity and, within a span of 10 minutes, two children fainted and were carried up into the area between police lines. Red Cross personnel brought in bags of water, but it was not enough to reach the back of the crowd packed onto the highway. Eventually, families with infants and small children were allowed to pass. After another 30 minutes, the rest streamed into Guatemala, with many cheering ‘Yes we can!’ as they marched past riot police. The caravan was making its way up through southern Guatemala on Tuesday, but the next two borders they eventually plan to cross may prove even more difficult. Both Mexico and the US Embassy in Honduras issued statements over the weekend, saying migrants will need proper documentation to be able to cross their borders. On Tuesday, Trump warned that if the caravan of migrants were not stopped, the US would cut off millions of dollars in aid to Honduras. Those travelling as part of the caravan know they may not make it to the US and what it may mean if they do. Trump’s zero-tolerance immigration policy was heavily scrutinised earlier this year when his administration implemented a practice of separating families at the border. Although the president has since put an end to the practice, hundreds of children remain separated from the families as Trump continues to try to make good on his promise of cracking down on immigration, especially as the November US midterm elections approach. For Pena, the risks far outweigh the potential consequences of staying in Honduras. She said if they don’t make it to the US, she has family they could stay with in Mexico. The most important thing, she said, was getting her grandchildren out of their home country.